In economics, tax incidence or tax burden is the effect of a particular tax on the distribution of economic welfare. The introduction of a tax drives a wedge between the price consumers pay and the price producers receive for a product, which typically imposes an economic burden on both producers and consumers. The concept was brought to attention by the French Physiocrats, in particular François Quesnay, who argued that the incidence of all taxation falls ultimately on landowners and is at the expense of land rent. Tax incidence is said to "fall" upon the group that ultimately bears the burden of, or ultimately has to pay, the tax. The key concept is that the tax incidence or tax burden does not depend on where the revenue is collected, but on the price elasticity of demand and price elasticity of supply. The theory of tax incidence has a number of practical results. For example, United States Social Security payroll taxes are paid half by the employee and half by the employer. However, some economists think that the worker bears almost the entire burden of the tax because the employer passes the tax on in the form of lower wages. The tax incidence is thus said to fall on the employee. However, it could equally well be argued that in some cases the incidence of the tax falls on the employer. This is because both the price elasticity of demand and price elasticity of supply effect upon whom the incidence of the tax falls. Price controls such as the minimum wage which sets a price floor and market distortions such as subsidies or welfare payments also complicate the analysis. Imagine a $1 tax on every barrel of apples a farmer produces. If the farmer is able to pass the entire tax on to consumers by raising the price by $1, the product (apples) is price inelastic to the consumer. In this example, consumers bear the entire burden of the tax--the tax incidence falls on consumers. On the other hand, if the apple farmer is unable to raise prices because the product is price elastic, the farmer has to bear the burden of the tax or face decreased revenues--the tax incidence falls on the farmer. If the apple farmer can raise prices by an amount less than $1, then consumers and the farmer are sharing the tax burden. When the tax incidence falls on the farmer, this burden will typically flow back to owners of the relevant factors of production, including agricultural land and employee wages. Where the tax incidence falls depends (in the short run) on the price elasticity of demand and price elasticity of supply. 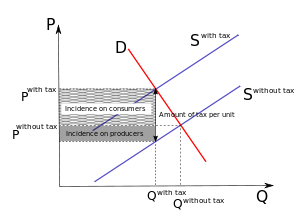 Tax incidence falls mostly upon the group that responds least to price (the group that has the most inelastic price-quantity curve). 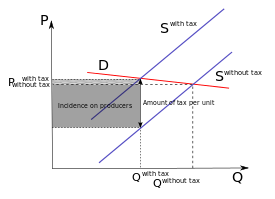 If the demand curve is inelastic relative to the supply curve the tax will be disproportionately borne by the buyer rather than the seller. If the demand curve is elastic relative to the supply curve, the tax will be borne disproportionately by the seller. If PED = PES the tax burden is split equally between buyer and seller. For a primer on reading supply and demand graphs, see Supply and demand. For a primer on the economic effects of a tax, see Tax. Because the producer is perfectly inelastic, they will produce the same quantity no matter the price. Because the consumer is elastic, the consumer is very sensitive to price. A small increase in price leads to a large drop in the quantity demanded. The imposition of the tax causes the market price to increase from P without tax to P with tax and the quantity demanded to fall from Q without tax to Q with tax. Because the consumer is elastic, the quantity change is significant. Because the producer is inelastic, the price doesn't change much. The producer is unable to pass the tax onto the consumer and the tax incidence falls on the producer. In this example, the tax is collected from the producer and the producer bears the tax burden. This is known as back shifting. If, in contrast to the previous example, the consumer is perfectly inelastic, they will demand the same quantity no matter the price. Because the producer is elastic, the producer is very sensitive to price. A small drop in price leads to a large drop in the quantity produced. The imposition of the tax causes the market price to increase from P without tax to P with tax and the quantity demanded to fall from Q without tax to Q with tax. Because the consumer is inelastic, the quantity doesn't change much. Because the consumer is inelastic and the producer is elastic, the price changes dramatically. The change in price is very large. The producer is able to pass (in the short run) almost the entire value of the tax onto the consumer. Even though the tax is being collected from the producer the consumer is bearing the tax burden. The tax incidence is falling on the consumer, known as forward shifting. Most markets fall between these two extremes, and ultimately the incidence of tax is shared between producers and consumers in varying proportions. In this example, the consumers pay more than the producers, but not all of the tax. The area paid by consumers is obvious as the change in equilibrium price (between P without tax and P with tax); the remainder, being the difference between the new price and the cost of production at that quantity, is paid by the producers. The supply and demand for a good is deeply intertwined with the markets for the factors of production and for alternate goods and services that might be produced or consumed. Although legislators might be seeking to tax the apple industry, in reality it could turn out to be truck drivers who are hardest hit, if apple companies shift toward shipping by rail in response to their new cost. Or perhaps orange manufacturers will be the group most affected, if consumers decide to forgo oranges to maintain their previous level of apples at the now higher price. Ultimately, the burden of the tax falls on people—the owners, customers, or workers. However, the true burden of the tax cannot be properly assessed without knowing the use of the tax revenues. If the tax proceeds are employed in a manner that benefits owners more than producers and consumers then the burden of the tax will fall on producers and consumers. If the proceeds of the tax are used in a way that benefits producers and consumers, then owners suffer the tax burden. These are class distinctions concerning the distribution of costs and are not addressed in current tax incidence models. The US military offers major benefit to owners who produce offshore. Yet the tax levy to support this effort falls primarily on American producers and consumers. Corporations simply move out of the tax jurisdiction but still receive the property rights enforcement that is the mainstay of their income. A country or state's tax burden as a percentage of GDP is the ratio of tax collection against the national gross domestic product (GDP). This is one way of illustrating how high and broad the tax base is in any particular place. Some countries, like Denmark, have a high tax-to-GDP ratio (as high as 48%, the highest in the world). Other countries, like India, have a low ratio. Some states increase the tax-to-GDP ratio by a certain percentage in order to cover deficiencies in the state budget revenue. In states where the tax revenue has gone up significantly, the percentage of tax revenue that is applied towards state revenue and foreign debt is sometimes higher. When tax revenues grow at a slower rate than the GDP of a country, the tax-to-GDP ratio drops. Taxes paid by individuals and corporations often account for the majority of tax receipts, especially in developed countries. The burden from taxation is not just the quantity of tax paid (directly or indirectly), but the magnitude of the lost consumer surplus or producer surplus. The concepts are related but different. For example, imposing a $1000 per gallon of milk tax will raise no revenue (because legal milk production will stop), but this tax will cause substantial economic harm (lost consumer surplus and lost producer surplus). When examining tax incidence, it is the lost consumer and producer surplus that is important. See the tax article for more discussion. If the government requires employers to provide employees with health care, some of the burden will fall on the employee as the employer will pass it on in the form of lower wages. Some of the burden will be borne by employer (and ultimately the customer in form of higher prices or lower quality) since both the supply of and demand for labor are highly inelastic and have few perfect substitutes. Employers need employees largely to the extent they can substitute employees for machines, and employees need employers largely to the extent they can become self-employed entrepreneurs. An uneducated population is therefore more susceptible to bearing the burden because they are more easily replaced by machines able to do unskilled work, and because they have less knowledge of how to make money on their own. Taxes on easily substitutable goods, such as oranges and tangerines, may be borne mostly by the producer because the demand curve for easily substitutable goods is quite elastic. Similarly, taxes on a business that can easily be relocated are likely to be borne almost entirely by the residents of the taxing jurisdiction and not the owners of the business. The burden of tariffs (import taxes) on imported vehicles might fall largely on the producers of the cars because the demand curve for foreign cars might be elastic if car consumers may substitute a domestic car purchase for a foreign car purchase. If consumers drive the same number of miles regardless of gas prices, then a tax on gasoline will be paid for by consumers and not oil companies (this is assuming that the price elasticity of supply of oil is high). Who actually bears the economic burden of the tax is not affected by whether government collects the tax at the pump or directly from oil companies. Assessing tax incidence is a major economics subfield within the field of public finance. Most public finance economists acknowledge that nominal tax incidence (i.e. who writes the check to pay a tax) is not necessarily identical to actual economic burden of the tax, but disagree greatly among themselves on the extent to which market forces disturb the nominal tax incidence of various types of taxes in various circumstances. The effects of certain kinds of taxes, for example, the property tax, including their economic incidence, efficiency properties and distributional implications, have been the subject of a long and contentious debate among economists. The empirical evidence tends to support different economic models under different circumstances. For example, empirical evidence on property tax incidents tends to support one economic model, known as the "benefit tax" view in suburban areas, while tending to support another economic model, known as the "capital tax" view in urban and rural areas. There is an inherent conflict in any model between considering many factors, which complicates the model and makes it hard to apply, and using a simple model, which may limit the circumstances in which its predictions are empirically useful. Lower and higher taxes were tested in the United States from 1980 to 2010 and it was found that the periods of greatest economic growth occurred during periods of higher taxation. This does not prove causation. It is possible that the time of higher economic growth provided government with more leeway to impose higher taxes. ^ See, e.g., Zodrow GR, Mieszkowski P. "The Incidence of the Property Tax. The Benefit View vs. the New View". In: Local Provision of Public Services: The Tiebout Model after Twenty-Five Years—Zodrow GR, ed. (1983) New York: Academic Press. 109–29. ^ LEONHARDT, DAVID (September 15, 2012). "Do Tax Cuts Lead to Economic Growth?". nytimes.com. The New York Times Company. Retrieved 16 April 2014. ^ Blodget, Henry (21 September 2012). "BOMBSHELL: New Study Destroys Theory That Tax Cuts Spur Growth". www.businessinsider.com. Business Insider, Inc. Retrieved 16 April 2014.